There are over 13 million people estimated to be employed in the forestry sector worldwide, from lumberjacks and sawmillers to tree surgeons and arborists. Yet the difficult circumstances that are usually found in forestry, timber and tree-felling work mean that accidents, injuries and fatalities are more likely to happen than in most other industry sectors. When you undertake a career in forestry or tree felling, you are likely to spend lots of time working outdoors. A tree surgeon, for instance, is required to be skilled in a number of disciplines including tending to trees that have become diseased or weakened, emergency tree care after a damaging storm, general planting of trees and shrubs and tree surgeons can also treat trees that are being attacked by pests. A tree surgeon or forestry worker might also find themselves carrying out activities such as calculating the size of trees and assessing the safety of them. Trees are often located in places where people walk so they require skill and training to deal with. Working at height always carries risk, it is the number one cause of workplace fatalities. It only takes a fall from a couple of metres before an awkward landing can cause serious injury. Tree surgeons work in a high-risk environment and so require specialist training to help prevent serious accidents or injuries from occurring. According to the HSE, felling trees and operating a chainsaw are two of the most dangerous tasks to undertake, making forestry and tree surgeon jobs particularly hazardous. The figures released show that during the last 10 years 24 tree surgeons/arborists have been killed during tree work and nearly 1,400 have suffered an injury. 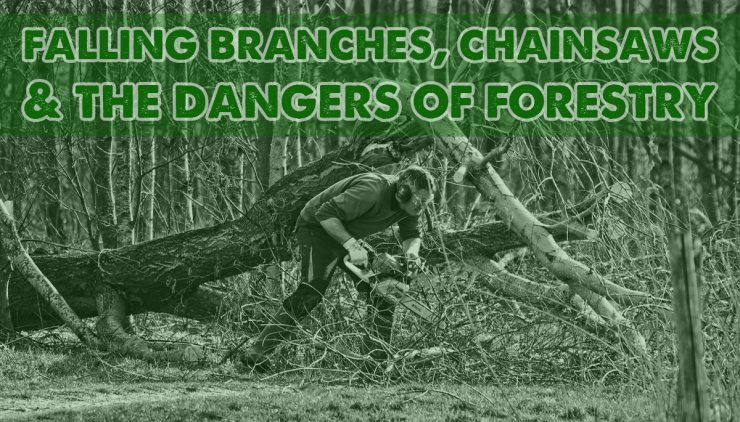 The major causes of timber-related fatal accidents are being struck by falling trees or branches and accidents with chainsaws, which are typically very serious. There are also some serious occupational health issues to consider such as hearing loss, repetitive stress injury or chemical exposure from pesticides so the wearing of the correct PPE and protective clothing to help protect against these type of injuries is of vital importance. If you are working at height and need to use a chainsaw, you will probably have it attached to you. This means you are at great risk. If you slip with a live chainsaw attached to you, the consequences could be fatal. Whilst most modern chainsaws have built-in safety features to help prevent this type of accident occurring, chainsaw fatalities remain one of the biggest killers in the timber industry. What Types of Insurance Do Arborists Need? If you run a tree surgery or arborist business and have employees using rigging equipment such as ropes to climb tree trunks, you may wish to consider employers liability insurance in case they have an accident. You may also want to consider plant cover for any heavy machinery that you use such as chippers, mulchers, shredders and splitters. Tree surgeons and arboriculturalists also face the risk of legal action being taken against them by the public for personal injury or property damage that they may be liable for, arising during the course of their daily work life. For instance, a wood chipper sends a chunk of wood flying which injures a member of the public walking past. If you make a mistake and damage something or injure somebody, a public liability insurance policy will help to cover any potential financial costs. Ashburnham Insurance provides comprehensive public liability insurance for tree surgeons, from arborists and foresters to loggers, lumberjacks and tree fellers. Public liability insurance for tree surgeons is not compulsory by law but vital to ensure your business’ financial stability.